Porsche will make 250 units of the 911 Sport Classic. Sales start in January 2010. Porsche is planning some sports-car candy for the Frankfurt auto show: the limited-edition 911 Sport Classic, which blends styling cues from the brand's storied past with the always intoxicating notion of more power. The 911 Sport Classic will be limited to just 250 units and will start at 169,300 euros (about $241,000) before tax. The car will join the new 911 Turbo, the GT3 RS and the Cup racer on the Porsche stand in Frankfurt. The retro look is evident at first glance, with a ducktail rear spoiler that channels the 1973 Carrera RS 2.7. The wheels are 19-inch customs with five-spoke centers painted black to evoke the Fuchs rims worn by 911s of yesteryear. But this isn't a simple throwback. The 911 Sport Classic gets an additional 23-hp to boost output to 408-hp from a 3.8-liter flat-six with direct injection. It's paired with a six-speed manual transmission. Ceramic composite brakes are standard, and the car gets a sports suspension and mechanical locking rear axle differential. The car is based on the rear-drive Carrera S but uses the wider body of the Carrera 4S, which adds 44mm (1.73 inches) to the back fenders for a wider track. The roof is a new setup, dubbed a double-dome, and the front gets a sporty fascia. The interior gets woven leather, sports seats and espresso coloring. 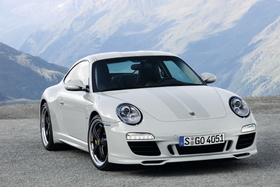 Sales of the Porsche 911 Sport Classic start in January 2010.